Now this was a first time visit for me to a live performance by Collabro. They first came to prominence afterappearing in, in fact winning, Britain’s Got Talent back in 2014. So the story goes they met upstairs in a pub and a month later appeared on Britain’s Got Talent doing this. So in the spirit of full disclosure I will say I knew of the tour and what made me eventually book was the fact that Kerry Ellis was their special guest. 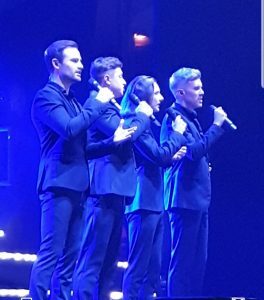 So Collabro or Michael Auger, Jamie Lambert, Matt Pagan and Thomas Redgrave are as we’ve discovered are a hybrid of a boy band and Musical Theatre act. Their fans are called ‘Collaborators’. This is a very professional show. Their interactions between themselves and with the audience are fun and make the evening go with a pace. However I’m getting ahead of myself here. I remember years ago going to see Little & Large (yes I am that old) and they only did about 45 minutes in the second half of the show after we ‘were treated to’ (read endured) about half a dozen support acts. Add to this the fact that this act was described on one website I saw as a young ‘Jazz fusion’ band. Now again alarms sounded based on my evening seeing ‘Lenny’ ( a play about the comedian Lenny Bruce ) in London in 1996 (which I believe is before Georgia was born!) where there was a 40 minute free-style jazz performance unadvertised at the start of the evening. Finally I’ve never found a jazz performance I liked. They were brilliant, Georgia is a very talented young lady and her performance was for me nearly the highlight of the whole evening. Without a doubt she warranted equal billing and a tour of her own. She performed mostly her own material and the songs that stood out for me were “The Girl” and “Ireland” both brilliant. Her ‘adapted’ version of “My Favourite Things” from The Sound of Music brought a great new twist to an old classic. I went straight out at the interval and bought their CD EP. So having thoroughly enjoyed the support act it was to the main event. The live band appeared on stage and performed a brief overture of some of the shows that will feature in the boys set. I was happy to hear Miss Saigon and hopeful they would feature my favourite show. The guys entered to rapturous applause from their fans, you could spot the really big fans as they were at the front and had on their lanyards from when they attended the pre-show meet and greet. 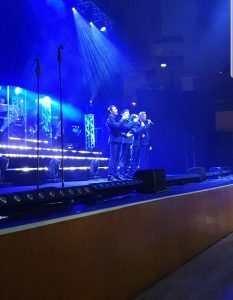 I have to say they didn’t disappoint, performing songs from their new album including: Grease, As if we never said goodbye, Why God Why (my favourite), as well as songs from Billy Elliot, Les Mis (of course), Jersey Boys, Evita, Wicked and The Greatest Showman. Their patter was fun, their voices great and overall an evening I really enjoyed. I would definitely go to see their next tour. The only, and I couldn’t call it a negative, but I could have done without the youth choir. Just a personal preference, and nothing against the choir involved. Kerry Ellis, as I expected deserves a special mention, as the (sadly only three) numbers she performed were excellent. She blew the walls off with what (I now believe) should be her signature tune “Anthem” from Chess, and then followed it with 2 songs from The Greatest Showman. I am now officially a Collaborator and also one the more ‘vintage’ youth who will be following Georgia! Oh and Kerry … well I already have a ticket to see her in a “songs from the Musicals” show in June!